The popularity of RISE has grown, and the support has definitely increased, which is also a beautiful thing. Having all of said support, RISE is able to present to the people, the Edutainment Convention, which is a 2 day showcase of talent from upcoming and established talent from the great city of Toronto. A little goes a long way, and for those who need a bit of perspective as to just how a small group from Scarborough are aiming to make a positive impact to people all around, how could I not support this? 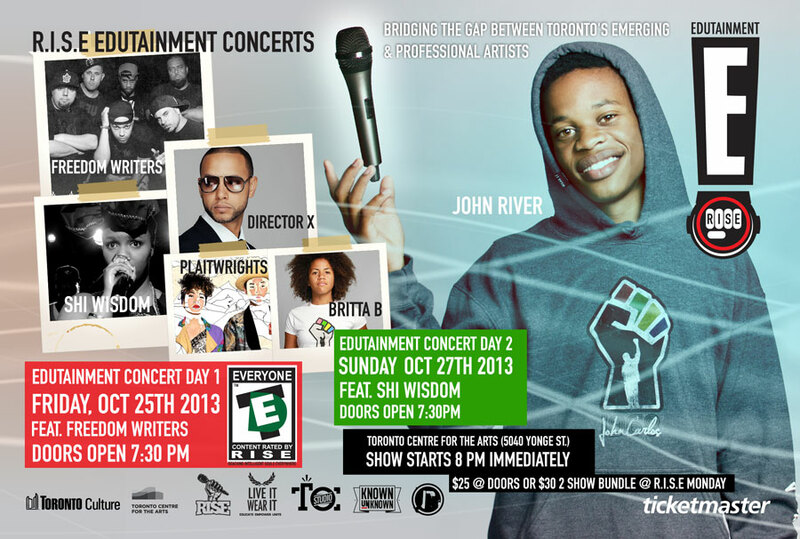 Acts like Shi Wisdom, The Freedom Writers, John River (whom I met at a RISE Monday), and others are lined up to appear. Edutainment is the purpose is the educate & entertain (I use the word sometimes), so I would definitely recommend anyone in the city to come out and show love. All info is on the flyer, and more info, definitely get in touch with RISE on twitter (@RisePoetry & @RandellAdjei).